On my second and last day in the La Sal Mountains I was tackling the highest summit in the range, Mt. Peale. 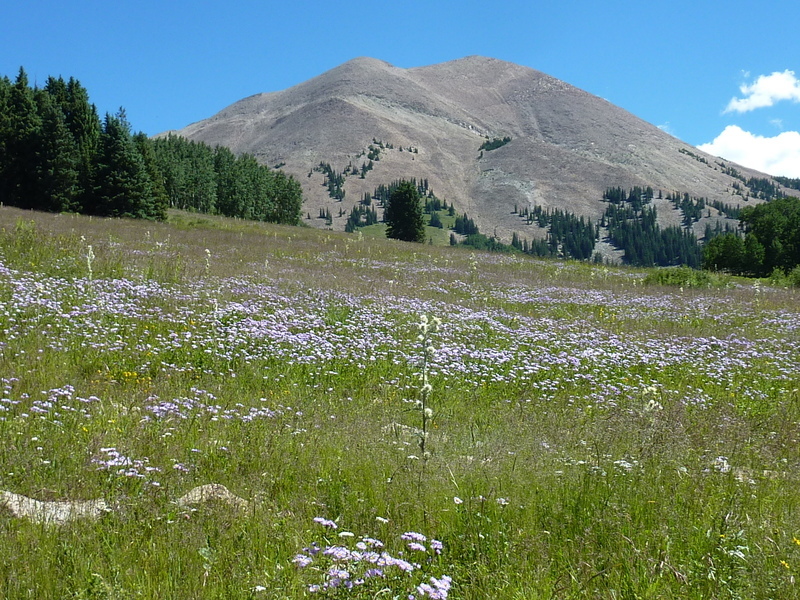 Though a county highpoint having in excess of 6,000ft of prominence, it is not a difficult outing from La Sal Pass where I had spent the night. Even combined with nearby Mt. Tukuhnikivatz (say that ten times fast), the outing took less than 5hrs, really just half a day's effort. A more ambitious outing could combine Mts. Laurel and Mellenthin to the north, but I wasn't feeling all that adventurous and was happy to keep the day relatively short. Starting off just after 6:30a, I followed the Burlfriends Trail for half a mile to its junction with the Tuk Trail, then following the latter for a short while before striking off cross-country along cow trails towards the gully on Peale's west side described in the literature. The cow trails ran out somewhere in the the forest above the meadows I had started in, some light bushwhacking eventually getting me to the start of the gully where I was happy to find a pretty decent use trail, ducked and all, leading up. The trail gets one through most of the talus in the gully but appears to peter out before reaching the crest. I climbed up the east side of the gully, past pikas and marmots unhappy with my intrusion, finally reaching the main crest just after 8a. Tukuhnikivatz rises high to the west with the Great Basin deserts stretching out to the horizon beyond. Another 20min saw me to the summit of Mt. Peale with another use trail appearing for a portion of the crest to get me around an intermediate pile of talus. It was a beautiful day with bright blue skies and clear views for many miles. To the north stretched the main bulk of the range with Mellenthin looking tantalizingly close. Ten miles to the east lay the Colorado border somewhere in the lowlands stretching out in that direction and equally far-reaching to the south. I spent a small stretch of time at the summit partially dismantling a large P14>rock wind shelter built among the talus for purposes of sleeping more comfortably there. My disappointment in finding these on too many occasions finally got me to act. I suppose some will say I'm endangering the lives of those "forced" to bivy at the summit in full winter conditions, to which I'll respond, "Bummer." I returned west along the crest from whence I'd come and then north to Pt. 12,145ft at the triple divide between the Brumley, Dark and La Sal Creek drainages. From this point Mt. Mellenthin was less than 1.5mi distance but I still couldn't convince myself to make the extra effort. There was a time when I probably wouldn't let the 2nd highest summit in a range go unclimbed so easily, but as I get older my definition of "fun" seems to encompass fewer hours spent on the trail. "Heresy!" some will say.